Few programs would remain unscathed in a budget that's already getting tough marks from Congress. Last week's first look at the FY 2020 budget, the third such request from the Trump Administration, indicated the White House wasn't intending to deviate much from past budget requests. The budget rollout continued this week as the White House Office of Management and Budget (OMB) released additional documentation, and several research funders also released their full budget justifications (see partial list below). These budgets provide far more detail program-by-program, but they don't change the basic story. As a reminder, the Bipartisan Budget Act of 2018, the most recent deal to raising the spending caps, will expire on October 1, the start of the 2020 fiscal year. The caps are scheduled to drop by 10 percent or $125 billion, with the defense reductions moderately larger as reported last week. The Trump Administration's budget would technically allow this drop in the caps to happen, but counteracts the defense cuts by adding $174 billion in emergency and war funding (known as Overseas Contingency Operations spending or OCO), none of which is actually subject to the spending caps. And so, year-over-year, defense spending would increase by 4.7 percent or $34 billion to $750 billion total, while nondefense spending would drop by 9.0 percent or $54 billion. But much of this is academic, as a split Congress is highly unlikely to go for such a maneuver. Nevertheless, the proposal would necessitate steep cuts to federal research spending, as made clear by the numbers released today (PDF warning). According to OMB data, total federal R&D would decline by 4.6 percent in FY 2020, with basic research down by 10.5 percent, and applied research down by 14.4 percent. These latter two figures especially represent steep cuts, though not quite as steep as the first full Trump Administration science budget. Or are they? These figures require an important caveat. Federal agencies were on a split appropriations timetable for the current fiscal year. Several big agencies like the Departments of Defense, Energy, and Health and Human Services had their appropriations completed on time last September; but several others like NASA, NSF, and USDA had to wait until the final omnibus in February. The delay meant these agencies couldn't generate reliable R&D estimates using their actual appropriations. Instead, the Administration simply assumed a full-year continuing resolution (CR), which essentially means flat funding or thereabouts, and based their R&D estimates on that assumption. Such a step has been taken before and it's perfectly reasonable given the circumstances. But it also means the R&D cuts in FY 2020 are likely underestimates, for the simple reason that NSF, NASA, USDA, and other agencies picked up funding increases in FY 2019, which a CR assumption misses. So what are the "real" numbers? At this point, there's no way to know. 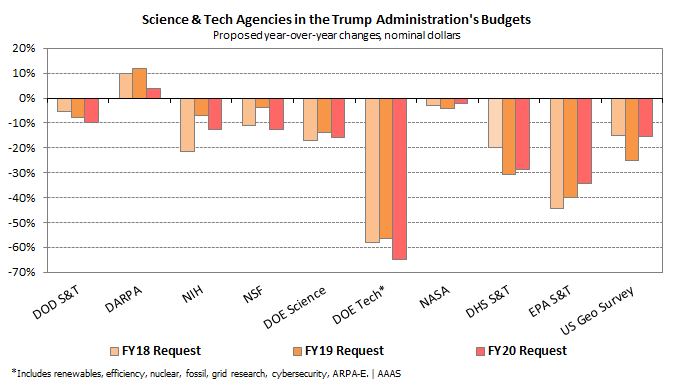 As can be seen in the graph above, the Trump Administration's FY 2020 funding request is rather similar to its prior budgets, especially the first full request from President Trump in FY 2018. That budget made waves as the toughest for R&D in decades, even cutting back on basic science programs that other administrations looking to shrink government might have still left alone. Last year's budget was marginally friendly to basic science funding, but clearly that approach didn't last long. Other previously-targeted areas continue to be slated for reductions. The budget continues to make heavy cuts to renewable energy and efficiency R&D programs, eliminate the Advanced Research Projects Agency-Energy, and trim other programs in fossil and nuclear energy. Environmental research is also under the knife as, for instance, the Department of Energy's Biological and Environmental Research program is facing a funding reduction of 30 percent. Elsewhere, the total number of new NSF research grants would drop by at least 11 percent from previous levels, with over 1,000 fewer grants. The Graduate Research Fellowship Program would support 1,600 new fellows, versus the 2,000 that NSF has annually supported in recent years. At NIH, the number of competing research project grants would decline by nearly a third, to 7,894 in FY 2020 from 11,675 estimated in the current year. The success rate would drop to below 14 percent, according to budget documents. Further details were posted last week, and we'll have more in the coming days. Congress Ready to Move On? Again, none of this may matter much. Certainly House Democrats are unimpressed: Appropriations Committee Chair Nita Lowey (D-NY) has said of the new budget, “President Trump has somehow managed to produce a budget request even more untethered from reality than his past two.” But some Republicans have chimed in as well. Texas Republican Mac Thornberry, prominent defense advocate and ranking member of House Armed Services, has openly acknowledged that the new budget doesn't add up to much, and that a deal involving the nondefense cap is the only way to secure the defense spending increase he and his colleagues prefer. And legislators in both parties got to sound off on spending cuts to NIH, CDC, and other health agencies in a Labor-H hearing last week. Ultimately, then, this doesn't appear to be a budget that moves the needle much. AAAS will have more resources on the budget in the coming days.